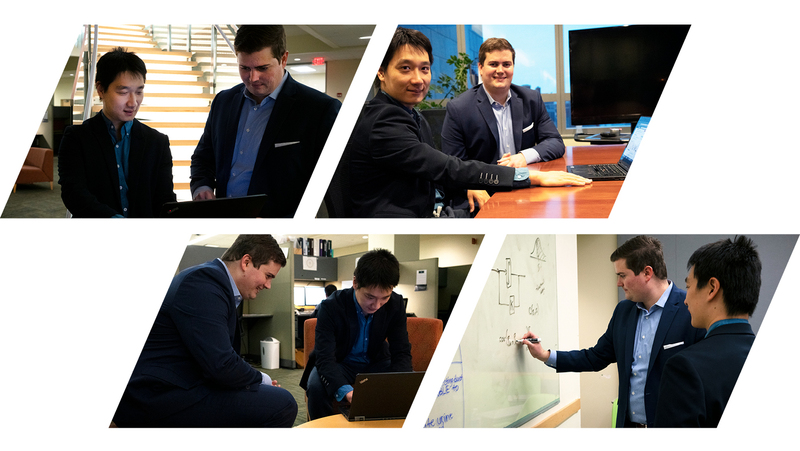 Anthony Rossi and Duanyi Wei, two University of Delaware graduate students, were working side-by-side in a robotics lab when the idea that led to Lyapunov Technologies first emerged. The pair decided to explore how their robotics background might apply to hedge fund management. Their unique algorithmic approach uses a reliable systematic decision making process which helps manage trading risk commonly seen in the hedge fund world. Rossi and Wei realized that their engineering skills would only take them so far in the process of creating an algorithm for investing. With the goal of increasing their industry knowledge, Rossi chose to pursue a UD Lerner MBA and Wei audited several business courses. They also began using the resources at the Horn Entrepreneurship Venture Development Center, and joined the Summer Founders program. What started as an idea in the robotics lab began to take shape as a business. The pair incorporated Lyapunov Technologies in the summer of 2017. With their company newly incorporated, Rossi and Wei still needed the skills and opportunity to effectively present their transformational approach to professionals. They applied to five startup pitch competitions and were finalists in four of them. One of the most impactful of these competitions was the Southeastern Hedge Fund Competition. To compete in the Southeastern Hedge Fund Competition, Rossi and Wei worked with professor of finance Richard Jakotowicz as their advisor. He served as a helpful resource for professional investment knowledge – sharing pointers on presentation strategy and backtest charts – ultimately helping the team to develop their application. Lyapunov Technologies was one of five teams to head into the finals. At the final competition in Atlanta, Georgia, the Lyapunov Technologies algorithm stood out from the competition as the only one that was highly technical, based in a quantitative approach. Beating out teams from MIT, Duke and other top business programs, Rossi and Wei left the competition with a third place win and important industry contacts. Both Rossi and Wei graduated in December 2018 and will be pursuing the business full-time. The pair credits much of their success to what they called a “super interdisciplinary collaboration” between the College of Engineering, the Lerner College and Horn Entrepreneurship. Lyapunov Technologies has already begun doing proprietary trading for several firms that they met during the Southeastern Hedge Fund Competition. Rossi and Wei also said that their decision making process for hedge funds could be altered and applied in other areas. They are now seeking new partnerships in banking and the credit card industry, where the similar decision-making process exist. They are also developing new iterations of the technology to give these parties new insights. Lyapunov Technologies is now headquartered in Wilmington, Delaware at 1313 Innovation, a co-working space founded by UD alumnus Paul McConnell and is working on their next big idea.